Investment in Water Entitlement and Water Allocation assets provides an opportunity for low risk exposure to the growing global demand for agricultural commodities via supply of the key limiting factor in nearly all food and fibre production systems; water. Australia’s political stability, strong history of supporting property rights and commitment to improving the transparency of water access together provide significant strengths for Investors. The value of the market for Water Entitlement assets in Australia has been estimated at $55 billion2. The Fund is able to invest in regulated surface Water Entitlements and ground Water Entitlements throughout Australia. However, to date it has focused on acquiring assets in the $15.93 billion market for regulated surface Water Entitlements in the southern Murray-Darling Basin (sMDB). The sMDB water market is one of the more sophisticated water trading and utilisation platforms in the world with average annual turnover in the 10 years to 30 June 2018 of more than $240 million4. The system of regulated trade across the sMDB creates the ability to construct a suitably diversified portfolio that delivers capital growth potential with steady long-term income yields. 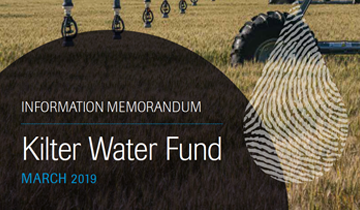 The Fund generates returns by deploying Water Entitlements and Water Allocation assets for irrigation use across a diversity of agricultural water users, industries and geographic areas. This provides Investors with direct access to the emerging agricultural commodity investment opportunities without the complexities of direct farmland management. As an alternative real asset class for investment, water is placed to significantly benefit from the structural trends influencing current and future global food production and markets. Given the perpetual nature of the Fund’s investment assets and cognisant of international and local projections of future water asset scarcity, the Fund is structured as an open-ended unregistered managed investment scheme. Redemptions are permitted after an initial two-year lock-up. Given potential cyclical movements, Kilter Rural considers water within the context of a medium to long term investment horizon. As part of a broader portfolio, water provides diversification and risk mitigation as it is a source of returns that is truly uncorrelated with traditional investment asset classes. Kilter Rural is seeking to expand investor participation in the Fund. In connection with this offer the Trustee has issued an Information Memorandum dated 13 March 2019. 2. Kilter Rural analysis based on data sourced from the Bureau of Meteorology, Murray-Darling Basin Authority, Victorian and NSW Water Registries, Aither Water Markets Report 2017-18 Review and 2018-19 Outlook and websites published by Ruralco and Waterfind. 3. Aither Water Markets Report 2017-18 Review and 2018-19 Outlook. 4. Kilter Rural analysis based on information sourced from state water registers. Enter your details below to download the full Kilter Water Fund Information Memorandum.